Apple is once again in the crosshairs of a major media outlet over supposed worker rights abuse, this time with supplier Pegatron caught on undercover video questionable treatment of workers at an iPhone 6 factory. In a hyped exposé aired Thursday night, BBC One reports multiple instances of what it refers to as "poor treatment" of workers on a Pegatron production line tasked with assembling Apple's latest iPhone 6 handset. The broadcast is the latest in a long line of reports concerning worker rights at factories in Apple's massive overseas supply chain, most of which saddle Apple with the blame for lacking proper oversight. The BBC Panorama investigation put embeds with hidden cameras to work at Pegatron's iPhone factory, who quickly found inconsistencies with Apple's promised safeguards outlined in its Supplier Responsibility report (PDF download). Undercover reporters discovered numerous infractions, including illegal ID card confiscation, excessive working hours, poor living conditions and underage workers. From the clips provided, it appears the most egregious breaches involve long working hours. According to Apple standards, overtime is voluntary for workers at its supplier factories, though BBC reporters found extra work was built in to their contracts. "Every time I got back to the dormitories, I wouldn't want to move," said one reporter whose longest shift was 16 hours. "Even if I was hungry I wouldn't want to get up to eat. I just wanted to lie down and rest. I was unable to sleep at night because of the stress." 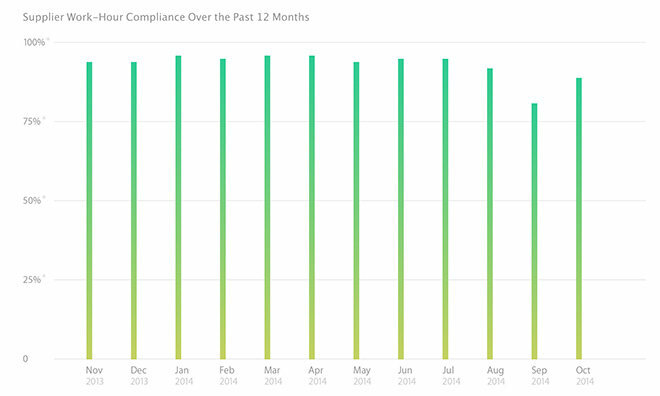 Supplier work-hour compliance according to Apple data. For its part, Apple championed its ongoing response to labor issues in China, a country known for its dubious treatment of workers as seen through the lens of Westerners. "We are aware of no other company doing as much as Apple to ensure fair and safe working conditions," Apple said in a statement. "We work with suppliers to address shortfalls, and we see continuous and significant improvement, but we know our work is never done." Pegatron has been in the news before for allegedly breaking China's labor regulations. Last year, labor rights watchdog China Labor Group discovered wage and safety violations at multiple plants operated by the iPhone and iPad partner supplier. Like the BBC's investigation, CLW saw workweeks that often exceed Apple's specified 60-hour limit, as well as ID card confiscation. Moving south, the BBC visited Bangka island in Indonesia to check on metal ore collectors who gather tin and other minerals to sell to smelters on Apple's list of suppliers. Children were seen digging out tin ore by hand under unsafe conditions that could potentially lead to deadly landslides. In a Supplier Responsibility report earlier this year, Apple said it planned to crack down on conflict minerals, especially those sourced from the Democratic Republic of the Congo, by releasing a quarterly report (PDF download) listing supplier smelters. 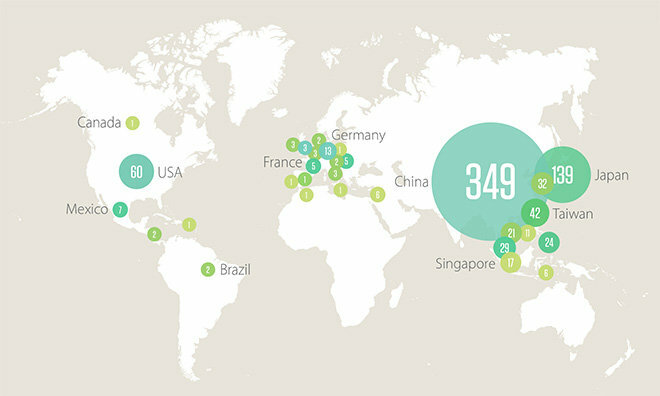 Graphical plot of Apple's supply chain by region. As AppleInsider reported in February, the electronics industry as a whole is responsible for over half of the world's tantalum consumption, but it is not a major consumer of tin, tungsten and gold. Without substantial buying power companies like Apple have little sway with smelters or collectors of those minerals. "The simplest course of action would be for Apple to unilaterally refuse any tin from Indonesian mines. That would be easy for us to do and would certainly shield us from criticism," Apple said in regard to Bangka. "But that would also be the lazy and cowardly path, since it would do nothing to improve the situation. We have chosen to stay engaged and attempt to drive changes on the ground."